Suitable for vegetarians. 1 of your 5 a day* *serving per half carton Aim to eat at least 5 portions of different fruit and vegetables a day. 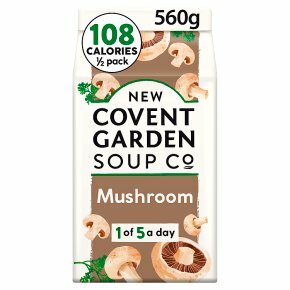 A beautifully simple yet indulgent recipe with mushrooms, flavoursome stock and single cream seasoned perfectly with rosemary, thyme and a twist of black pepper. Our chefs have done all of the hard work so all you need to do is sit back and enjoy this creamy, soul-warming soup! Ready in 5 1/2 minutes.Pour contents into a saucepan and heat gently for 5 1/2 minutes.Stir frequently but don't let it boil. Ready in 6 1/2 minutes.Microwave 900W (High 100%).Pour soup into a microwaveable bowl.Microwave for 3 minutes, stand for 30 seconds then stir.Microwave for a further 2 minutes and stand for 1 minute before serving.